My go to recipe for hummus. The cumin makes it great. Nice, very very light and fluffy. Tastes good the next day. Putting this on my list of potential good party snacks and appetizers. Be sure to add enough seasoning. I broiled the garlic along with the eggplant because I have an intolerance for raw garlic and I think that added nicely to the smoky flavor. This was a bit bland. Pg. 162. This was really good -- nice flavorings from the pepper flakes, orange and saffron. I used cod and monkfish and homemade fish stock made from shrimp shells. It's actually more of a stew than a soup -- it's very thick. It's also very tomatey, given both the tomato paste and the 28 oz of canned tomatoes. Next time I would cut down on the corn -- I felt there was just too much. Delicious. Can substitute mozzarella. A nice light meal. Can be made vegan/pareve by omitting yogurt. Makes a great filling for stuffed peppers. Also can replace meat when making a vegetarian moussaka, lasagna or shepherd's pie! Just season the pilaf the way you'd season the meat in those dishes! Super quick and delicious. I made it twice, once forgetting the lemon juice. Actually liked the mistake version better! Pleasant, easy, similar to Mexican style cilantro baked fish fillets I've made before. The recipe directions say to serve cold but I enjoyed it more at just a little above room temperature, soon after cooking. Disappointingly bland as written. While the fish and potatoes were tender after an hour baking, it was devoid of much flavor without adding some finishing olive oil, more salt, and I ended up serving with some pesto on the side. I think the "light" aspects of this recipe were to its detriment and if I were to make it again I would saute the onion first, perhaps with some garlic, and add some more spice. Or something. As written I would not repeat. used canned spanish piquillo peppers. wonderful. Imagine a diet based on pure pleasure! Mediterranean cuisine, with its pizza, pasta, bread and toothsome desserts, is endlessly sensuous and soul-satisfying - and it's also the healthiest diet in the world. In this book, Martha Rose Shulman creates an appealing alternative to the often frustrating process of dieting, with dishes brimming with authentic, traditional flavors but not loaded with fat. This book includes enticing recipes from every corner of the Mediterranean Basin, from France, Italy and Spain to North Africa, Lebanon and Yugoslavia. Age-old favorites, such as ratatouille and salad nicoise and mouthwatering temptations from Greek Tatziki and Italian antipasti to Tunisian Beet and Potato Salad and Turkish Cornbread, pepper every page. Each recipe is introduced with an anecdote about its origin and is followed by a complete nutritional breakdown. 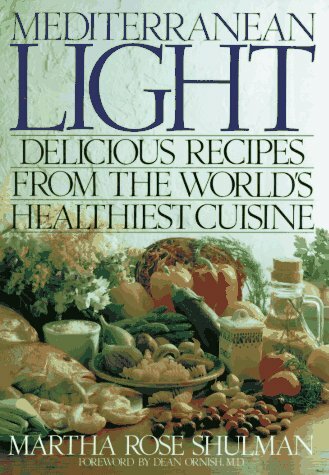 Dig into the most enjoyable, low-calorie, healthy eating in the world with Mediterranean Light.